Chord Mojo review | What Hi-Fi? Does anyone need a DAC with an upper sampling rate limit of 768kHz? We seriously doubt it. But get past that headline grabbing spec and it’s obvious that the Mojo could be the perfect solution for those who crave Chord’s £1400 Hugo but have stuttered at the hefty price. The name is short for ‘Mobile Joy’. Quite. Unlike many of its rivals, Chord has refused to use the off-the-shelf DAC chips inside its converters. Instead, the company’s digital products feature powerful programmable processors loaded with proprietary software to do the job. In our experience it’s an approach that works. The Mojo uses the latest and most powerful processors, which in theory makes it Chord’s most capable DAC, though there are many other factors that go into making a good sound. We’re not so positive when we first take it out of the box. It feels oddly shaped and we miss Chord’s traditional extravagant detailing. Such things have been discarded to meet the entry-level (by the company’s usual standards) price point. Here, the product name and logo are simply printed, which gives the game away about it being an obviously cheaper product. It takes us a while to get used to the minimal control layout. Three ball-like buttons take care of power on/off and the volume level. But press the two that look after volume while the unit is powering up and its output will be set to line level (make sure you don’t connect any headphones) - light behind the volume buttons turns blue to indicate this. There’s no display as such, but the power button lights up in different colours depending on the sampling rate of the input signal (red for 44.1kHz, green for 96kHz, white for DSD). Similarly, the lighting colour behind the volume buttons changes according to level. It’s a little confusing at first, but soon becomes second nature. 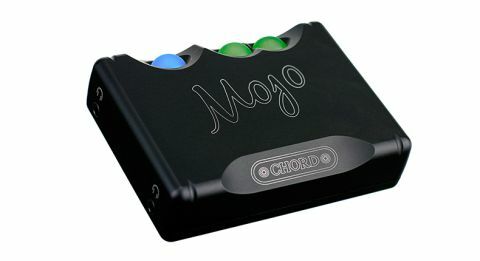 The Mojo is a small unit, with a footprint barely larger than a credit card, yet Chord has found space for a good range of connections. There’s (micro) USB, optical and coax, though the latter takes the form of a 3.5mm jack rather than the usual RCA or BNC, and a second USB connection for charging only. The inputs are auto sensing with USB taking priority followed by coax. Outputs are limited to a pair of 3.5mm jacks. We were pleased to discover that the unit’s performance doesn’t degrade notably when both connections are in use. Chord claims an output of 35mW into 600ohms, rising to 720mW into 8 ohms. This proves enough to get a good volume level from a range of headphones, including Grado PS500s, Beyerdynamic T51is and Shure SRH1540s. The DAC’s build quality is terrific. Despite the minimal detailing the Mojo feels like a solid chunk of metal. It’s aircraft-grade aluminium casing is beautifully machined and finished to an extremely high standard. At the moment only black is available, but we wouldn’t be surprised if a silver option appeared at some point. Fresh out of the box, the Mojo needs a minimum of 10 hours of charging. Once fully charged it should run for around 8 hours, depending on the headphones used and volume levels. Though it runs warm generally, it can get quite hot when charging, but this is nothing to worry about, apparently. You’ll need dedicated software drivers for Windows use (available on the Chord website), but most sources will work without additional software. Once up and running this a fabulous performer. We listen to Stevie Wonder’s Innervisions on DSD and are gripped from the unmistakable opening bars of Too High right through to the end of the album. There’s plenty of detail here, and the kind of insight into the recording that nothing we’ve heard up until the Hugo can better. But it’s not the excellent resolution that impresses us most. It’s the Mojo’s ability to organise all that information into a cohesive and music whole that makes it stand out from the competition. It delivers the hard charging rhythm track of Higher Ground brilliantly, communicating the song’s unstoppable momentum with real enthusiasm. The presentation is solid, full-bodied but avoids any hint of excess richness at mid- and low-frequencies. Mozart’s Piano Concerto No.12 (24-bit/192kHz) confirms the Mojo’s convincing tonal balance and reveals a surefooted handling of dynamics. It can convey power and scale when the music requires but has the finesse to make the most of the subtler passages too. We’re also happy with the unit’s refinement. Its transparency means that poor recordings (and sources) will be easy to spot, but this DAC won’t go out of its way to be nasty. That sense of organisation is clear here, as is the Mojo’s composure when the piece becomes demanding. There’s never any sense of stress, every note is given the space and attention it deserves. We think Chord has produced yet another winner here. The Mojo offers a large slice of the Hugo’s performance for a fraction of the cost. Even at £399, we have to conclude that it’s a bargain.